In a hot summer day which one is the best food for you to eat? For me the first choice is Kulfi or Ice cream. I remember during my school summer vacation days one old Kulfiwala used to come in our locality and we all friends were waiting for the bell which used to make us happy. 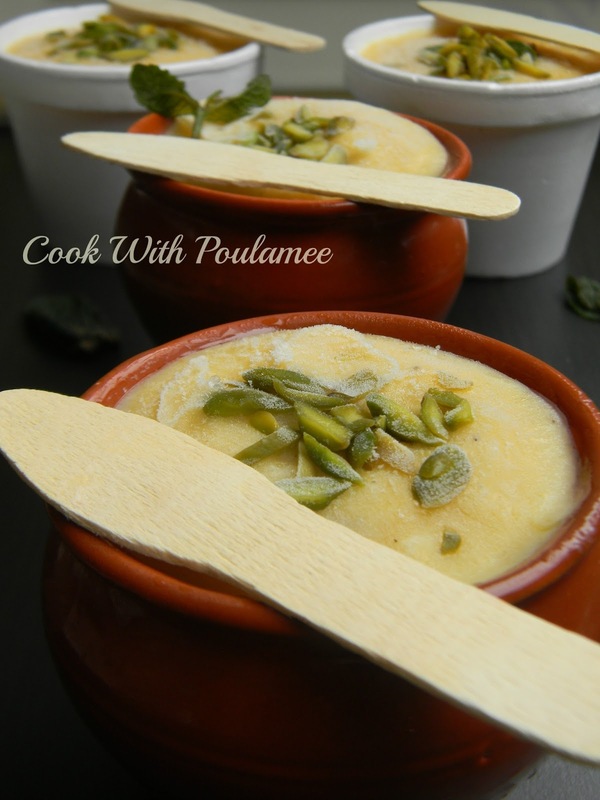 I still remember those kulfi’s taste. 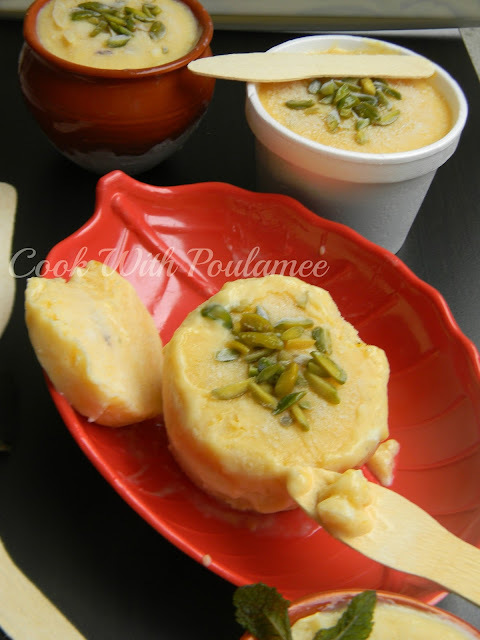 To cherish my childhood memories I prepared some MANGO KULFI for this hot summer day. They are really yummy and can’t stop myself to prepare these again and again. My little one was so happy to see this but hopefully next year I can give her the kulfi in proper shape, I just gave her some melted kulfi. I have few guests in next weekend I think this one will be the best dessert for a summer day. Cooking time: 15 to 20 mints. 1.Heavy milk : 2 small cup. 2.Condensed milk : ¾ cup. 3.One tea spoon corn flour. 4.Two mango (I use fresh mango u can use mango pulp too). 5.Half cup sugar or as per your taste. 7.Pinch of freshly crushed cardamom. Take out the mango pulp from the mangoes and blend it in a blender, and keep it aside. Now take one spoon of hot milk in a bowl and add the corn flour and saffron stands and keep it aside. 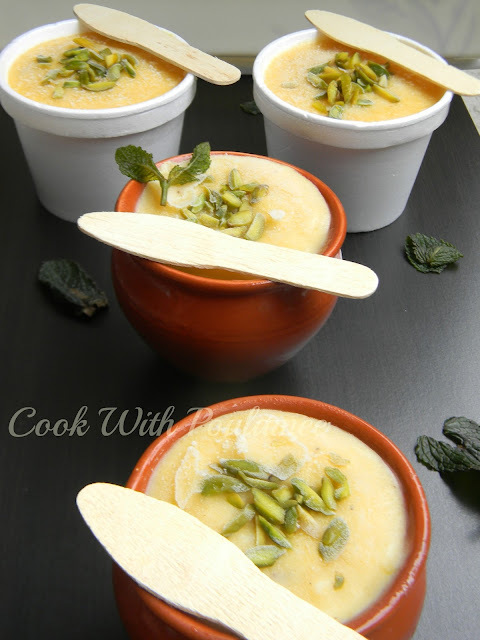 After 5 mints add the saffron milk mixture and sugar and stir for 5 mints. Let it become thick then switch of the flame and allow the mixture to cool. Now add the fresh mango pulp and mix nicely and put everything in a blender or a food processor and blend it nicely. Now pour the kulfi mixture into some kulfi cup/ mini condiment cups and freeze it for 6-8 hours for it to set completely. 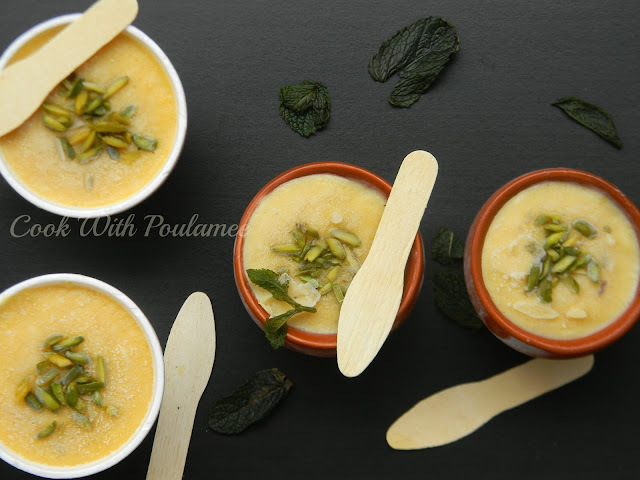 The super easy MANGO KULFI is ready now enjoy every bite with your loved one.